Junior asked Grandad "What about television then?" "Hey, don't rush me," replied Grandad. "I've only got two pairs of hands." 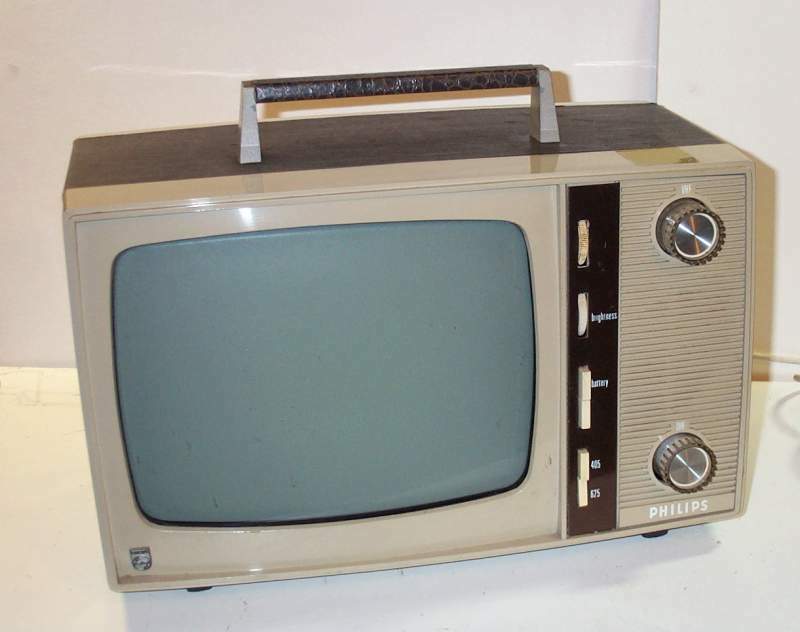 In fact, Grandad had been into the shed and found one of the televisions that he thought would interest Junior. 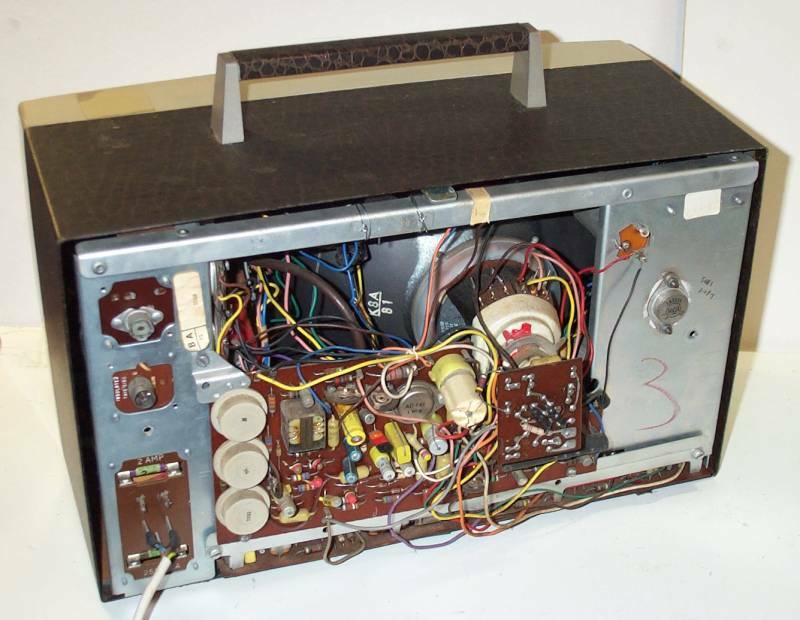 "This is a Philips TV-Ette television made in 1960, when not only were there two different broadcasters but also transistors had taken over from valves. This set is called a 'portable' set, but it isn't self-contained. It will take power from either mains or 12v electricity." "Does that mean that I could use it in the car?" asked Junior. "Well, yes, I suppose so, but you would still need a jolly good aerial stuck on the car's chimney," joked Grandad. "This set is a little unusual in having moulded plastic front and back panels, but a steel 'shell' into which it slides that makes up the body of the case. Jolly good for stopping interference." Using a coin, Grandad unscrewed the back panel and removed it. Inside the back Junior could see a load of wires and a printed circuit board with some stuff on. When he looked further in, he could see the cathode ray tube with the deflection coils around it's neck. "What does that coil of wire behind the tube do?" he asked. "That's called the 'deflection coil'," replied Grandad. "When a picture is shown on the set, it is made up from a single spot of light that flies very rapidly across and down the tube front. Like reading a page, it goes across very fast, drawing a line; each time it reaches the end it starts the next line and so on. When it reaches the bottom of the screen it goes back to the top and starts again. This is called 'scanning'. It happens so fast that there is hardly any flicker; your eye can't see the fast movement and just sees the complete picture. The spot is made by a stream of electrons sent from a cathode at the thin end of the cathode ray tube, near the back of the set. The deflection coils make a magnetic field that varies in a way that moves the electron stream so that the spot it makes on the front is in the right place at the right time. When it hits the front of the cathode ray tube, the chemical called 'phosphor' lights up, a bit like a fluorescent lamp does." "But how do colours appear?" asked Junior. "Well, this is a monochrome, or black-and-white set, so there are no separate colours. The lighter bits are made by turning up the spot brightness, and the darker bits by turning it down, all as the spot flies around the tube. "This set gets the information to do that, together with sound, from one of the built-in tuners. There are two, one for each of the two main bands that it can receive. The bands are given Roman numbering, for some reason. Band I is the original band that was used by the BBC. It is at the lowest frequency, from 47 to 68 MHz, although that seemed jolly high at the time! That is the bigger tuner at the top, which has a knob labelled 'VHF' (Very High Frequency). Band III was introduced later, and was used by ITV. It covers the frequencies 174MHz to 230MHz. This tuner is what is known as a 'turret tuner'. Under the metal cover is a rotating drum with lots of positions around the outside, each of which could hold a set of coils. Rotating the main knob moves the desired set to strip of contacts, so that those particular coils are used to tune the right channel. It 'clicks' into place at each position with a spring-loaded detent. A ring around the knob allows 'fine tuning' to get it spot on. If you lived in an area where the channels were different, your TV dealer fitted different coils, known as wafers or biscuits. This was good for bands I and III but didn't work for higher frequencies, where the lengths of connecting wires meant that it was impossible to make the coils small enough. Another similar type used a disk at the end that held the coils radially, rather than along the length of a barrel. Both types were originally used in valved receivers, but it seems that this receiver, which uses transistors, has the same type of tuner. 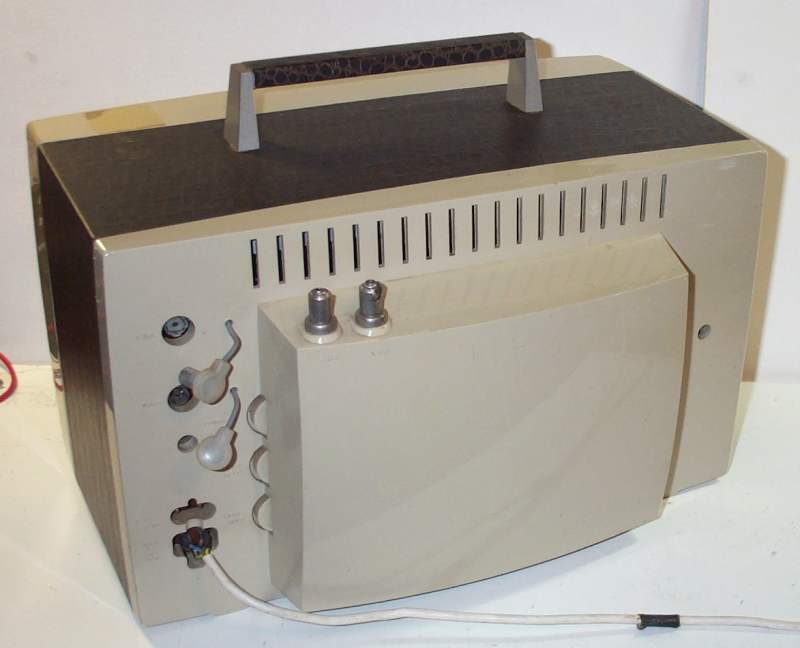 "The most modern transmissions of analogue television are on Bands IV and V, which span from 470MHz to 862MHz. That is received by the smaller tuner at the bottom, which has a knob labelled 'UHF' (Ultra High Frequency); you have to rotate this carefully to cover the whole band and find the station that you want. This set can still receive these channels, but soon all UK television transmission will be digital and this set will be unable to receive those broadcasts. "In between the two tuners is the mains transformer." 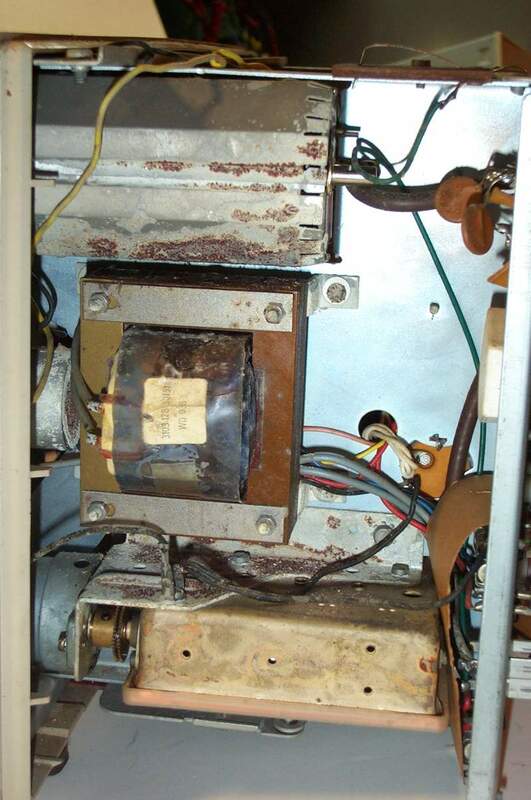 "Can we take off the cover of the turret tuner and look at the coils?" asked Junior. "It's a bit rusty and I don't want to break it," replied Grandad. "I'll try to loosen it for another visit." "What about Band II? You left it out," complained Junior. "Band II is used for FM radio programmes. It covers 87.5 MHz to 108MHz." replied Grandad. "What is the switch on the front labelled '405' and '625' for?" asked Junior. "The original picture standard had 405 lines of scan for each picture," replied Grandad, "405 line television was discontinued. But the later standard had 625 lines, which gave a more detailed picture with lines that didn't stand out so much. We still use the 625 line standard. This is what is used on bands IV and V"
"O.K. Grandad," said Junior, "I understand that Bands I and III are not used for television any more. So what are they used for? And what is in all the gaps between the bands?" Grandad didn't really know what Band I was used for now. "Band III is used for Digital Radio, known as DAB Radio," he said. "In between the bands, the frequencies are used for all sorts of things, from Amateur Radio to weather balloons and ship's communications. Also, right at the low frequency end is the normal radio transmissions on what we call Long, Medium and Short wavebands." "We have a DAB radio receiver," said Junior. "I didn't realise that it used a band that once transmitted television pictures!"